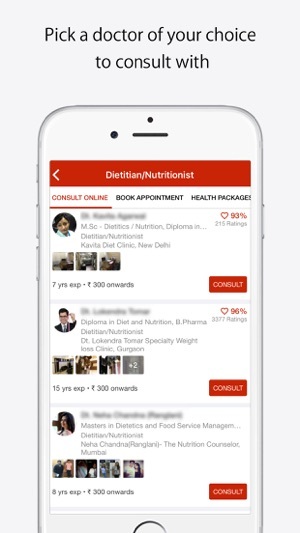 Lybrate – Consult a Doctor is India’s #1 Medical platform connecting over 10 million users to over 1,50,000 top Doctors and pathology labs. You can ask a FREE question about any health or fitness query and get multiple helpful answers from the best doctors within a few minutes. You can also find doctors across all major specialties and can either consult them online instantly or book an appointment to visit the clinic at your preferred time! 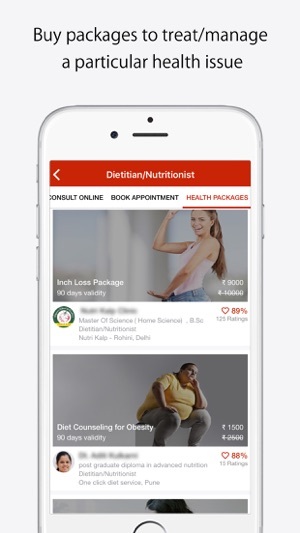 Lybrate – Consult a Doctor has revolutionized the way people in India think about and take care of their health and fitness. 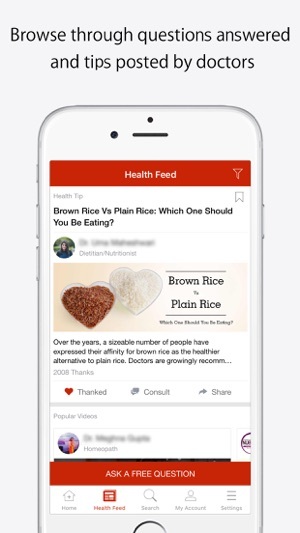 \ Ask FREE Health Questions: Ask doctor your health or fitness related questions anonymously. Get answers to your health queries from qualified doctors within few minutes. \ Book Appointments with Doctors: Find and book an appointment online with doctors. Find doctors online in Delhi NCR, Mumbai, Chennai, Kolkata, Pune, Bangalore, Hyderabad, Chandigarh, and other major cities of India. \ Consult Doctors Online: You can also consult doctors online privately in detail via text chat or audio/video call and get prescriptions if the doctor thinks it’s necessary. Share medical records, lab test reports, past prescriptions. \ Receive Health Tips: Get precious health tips and suggestions on a wide range of health issues from trusted doctors. Tips range from Ayurveda remedies to home remedies to clinical treatments to surgeries to diet plans to other fitness tips, etc. You can also choose to opt for a consultation with any particular doctor sending the tip. \ Manage Medical Records: You don’t need to manage those messy paper medical/health records anymore. Click a photo and upload your documents on the cloud to access those anytime anywhere. You can also ask your doctor to upload the prescription and other records for you on Lybrate after the appointment. \ NEW - Book Lab Tests: Now you can book home sample pickup for lab tests from NABL/CAP/ISO 9001 certified diagnostic labs like Metropolis, Quest Diagnostics, Thyrocare etc. Home pickup is available in Delhi, Gurgaon, Noida, Greater Noida, Faridabad, Ghaziabad, Mumbai, Bangalore, Pune and Hyderabad. Ear Nose and Tongue, Ayurveda, General Physician, Pediatrician, Dentist, Physiotherapist, Gastroenterologist, Cardiologist, Dietitian-Nutritionist, Endocrinologist, Ophthalmologist, Dermatologist, Gynaecologist/Gynecologist, Sexologist, And More. We’d love to hear from you. Questions, comments or ideas on how to improve the app? Drop us a line at hello@lybrate.com or tweet us @Lybrate. This app is simply great and doctors reply promptly on it. Online consultation has been made so easy and the doctor fees is also not much. Hassle free, easy to use, quick response by doctor are some key Benefits. The medication given by doctor have started showing effect after couple of dosage only. Worst app ever. 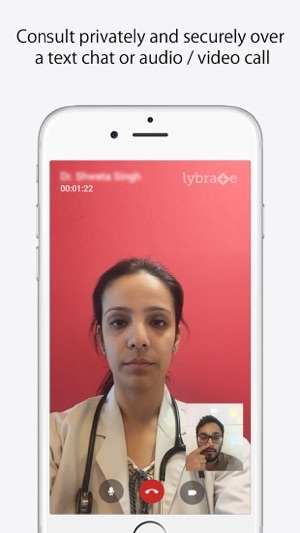 We booked a doctor’s appointment and were sent a confirmation through message as well as mail by Lybrate. However, when we reached the doctor’s clinic, we saw that the clinic’s door was locked. On checking with the doctor, we were informed that he was not intimated by the app that there was a booking and no mail was sent to him. Such an irresponsible way to treat a patient. Would not suggest this app to anyone. It’s a waste of time!